Walking onions are easy-to-grow perennial onions that I recommend for every vegetable garden. As their scientific name "Allium proliferum" suggests, these hardy onions are very "prolific." With one planting you will have onions every year for years to come! Walking onions are also called Egyptian Walking Onions, Tree Onions, Egyptian Tree Onions, Top Onions, Winter Onions, Multiplier Onions, Top-setting Onions and simply Perennial Onions." One of my listeners advised that these sometimes hard to find onions are available from Territorial Seed Company. The information below is from the companies web site. These true Egyptian topsetting onions are a smaller relative of the Catawissa onion. The topsets are a distinctive red color. A prolific producer of delicious green onions that you can harvest twice a year. Approximately 25-30 bulblets per ounce, but this can vary based on seasonal conditions. Multiplier and Topsetting Onions are shipped only in the fall-late September or early October, depending on the season. Quantities are limited; order before September 15th for best availability. Sorry, not available to Idaho or Canada. Allium cepa, Proliferum Group: These onions form several small bulbs underground, plus they produce clusters of reddish hazelnut-sized bulblets that form at the top of each seed stalk. Normal flowers do not occur. CULTURE: Plant bulblets 5-6 inches apart, 1 inch deep, in rows spaced 12 inches apart. Once walking onions have established themselves, you can harvest and cook the bulbs at the base of the plant and replant the bulblets gathered from the top of the stems. If left untended, you’ll get the term 'walking onion', as the onion stalks will bend down to the ground and take root all by themselves. HARVEST: The green tops can be harvested anytime. Harvest the bulbs in the ground from late summer through early fall. Use a garden fork to lift the clumps and separate the onions. In more severe microclimates, bulbs should be stored in winter and planted in the spring. The underground bulbs have a very strong flavor and can be used in a wide variety of your favorite recipes. The stalk bulblets are somewhat spicy. They can also be used when pickling other garden vegetables. Be sure to replant some of the bulblets to keep your walking onion patch going. Walking onion, or Allium cepa var. 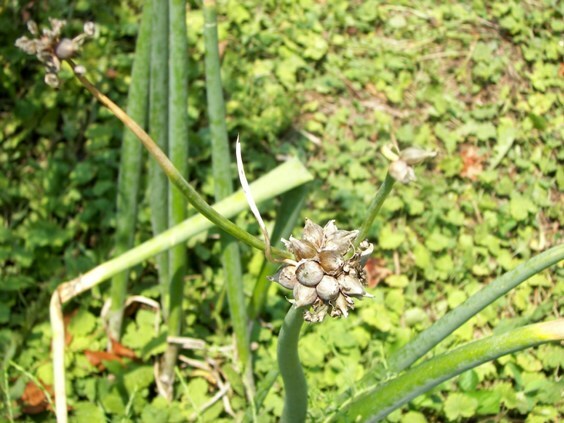 proliferum, is a distinct onion that is hard to miss in a garden because of its unique appearance once it blooms. It is also known as tree onion, topsetting onion, Egyptian onion or Catawissa onion. It originates from Canada, and became popular in kitchen gardens in the 1790s. Walking onion produces a tall green stalk about as thick as a thumb at the bottom. The stalk can be eaten like chives or spring onions early in the season. When a plant matures and is ready to bloom, it sends up a flower stalk that produces clusters of small onions called bulbils. These bulbils can be harvested and used like pearl onions or shallots. The name "walking onion" comes from the plant’s unique self-propagation habit. After a mature plant produces a set of bulbils on top of the stalk, it often sends out a shorter flower stalk from the bulbils and sets another cluster of bulbils at the end. This second set of bulbils weighs down the main stalk and allows bulbils to make contact with the soil several inches away from the mother plant. The bulbils will then root and start producing more plants. Without cultivation, this onion can easily naturalize and keep growing on its own in a field, however you can separate the bulbils, or plant them as a bunch about 8 inches apart in rows. This onion can be planted either in fall or spring, as it is hardy enough to survive our winter in the ground. If you plan on cultivating multiple varieties of walking onions and preserving their seeds, grow them at least 100 feet apart because they will cross-pollinate with each other. Walking onion is the first onion to appear in spring, as its green shoots will start to come up above the snow before it thaws. It blooms in early summer and bulbils can be harvested in mid to late summer. Walking onions are a perennial form of onions that are usually hard to find. One source is fromTerritorial Seed Company.